I’ve had a distaste for the Black Magic cameras since using the original cinema camera. I was tempted with the initial buzz of the pocket camera, but poor battery life and lens options deterred me to the mainstream. We shot in RAW or Cinema DNG format to give the most flexibility in post. We were using a Metabones speed booster converter to allow us to use Canon EF lenses. Primarily a Sigma 18-35 and an old NIKON 50mm. There was also a POLA filter and sometimes a vaseline filter on the lens. I have to say the material looked pretty amazing once we got it into post and started applying different looks. Even simple BM to REC 709 looks gave it a very filmic-16mm-Ektachrome quality. My initial bias aside I think it is a fine little camera. Maybe someday I’ll get to film with it again. Here is a frame grab with the temp grade applied using Sigma lens at 35mm. This is a frame grab of the close up using the Nikon 50mm. Lit with F&V z96 light. 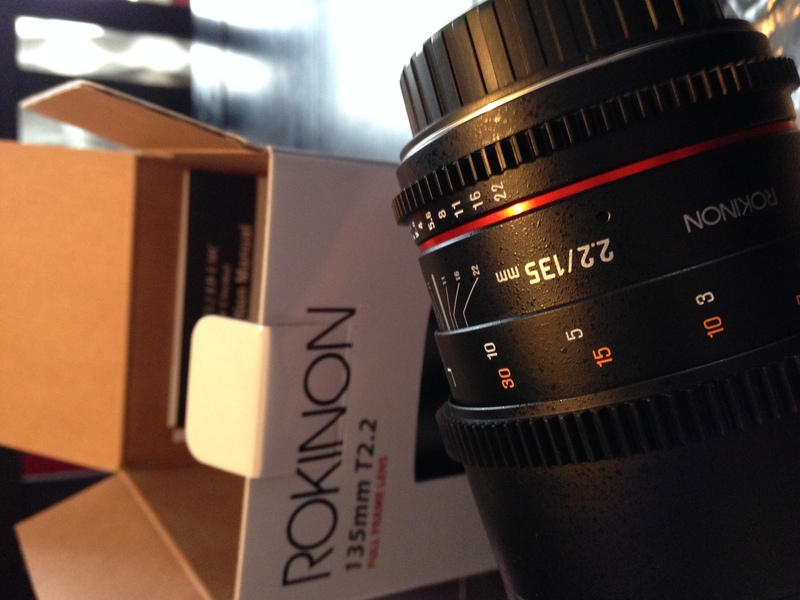 Matthew Duclos has touted the Rokinon Cine primes since they debuted. Now they have rehoused the lenses and branded them as Xeen Cinema Primes. 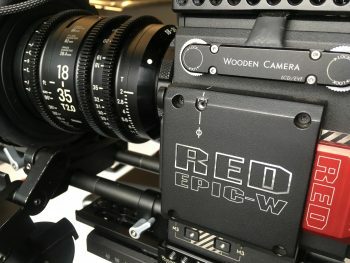 They have the physical look of a Zeiss CP2 or other large cinema lens with a price tag of $2500. So now you can get them in a variety of mounts and all that. Sounds great, anyone want to buy my used Cine DS primes? I came across this video on the duclos lens blog. 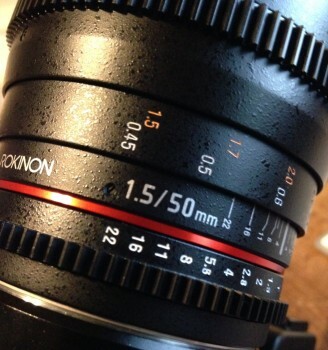 Great explanations of why lenses need to be designed for higher resolutions. It also does a nice job of defining factors in determining a lens’s quality. This just came in. I have been hoping that Rokinon would push the set to this focal length for a while. Especially shooting with the 5D MkIII or using the Meta Bones Speed Booster with Sony cameras. I’m looking forward to getting it side by side with the Canon 70-200 2.8. 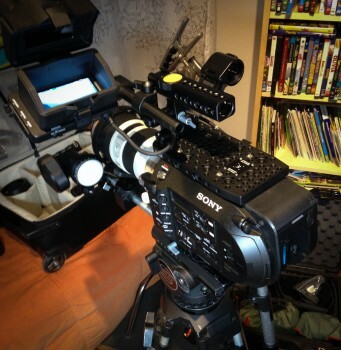 So I had the opportunity to rent and use the Sony Fs7 last week. I expected to like this camera, had one on order but postponed until some more work comes along. This outing was straight forward vox pop style interviews. I encouraged the producer to go with it so they could easily cut into the 4K image without a loss in resolution. The camera really is well laid out and easy to jump into using (for someone that has used dozens of cameras). The number one thing that myself and any other user is going to need to spend some time with is the the CINE settings. Shooting in Slog with LUTs can be confusing and an extra step in the process for post. Make sure that you and your post pipeline are familiar with this and do some testing. For this project we went with a fairly flat “Alexa” style LUT and baked it in by selecting that the LUT be applied to internal recording. If you are planning on filming long interviews I would recommend that you get the 128 GB cards. Shooting at 4K chewed through the 3 64GB card I had in no time or 32 minutes each. If you are downloading cards on set the reader is USB3 so make sure you bring a computer with this connection speed or you’ll be waiting a while. I was using the camera with the Metabones Ultra lens adaptor. This worked great with my Canon Full frame glass. I really appreciated having the built in ND filters on the camera rather than messing with screw in filters on the lens. I didn’t get to take advantage of the slow motion features too much on this project, but did run through it in my prep for the shoot. Like the Fs700 it has the capability to do slow motion in 1080. But unlike the Fs700 this camera can run at 180 FPS continuously. I look forward to taking the camera out again on the next shoot. 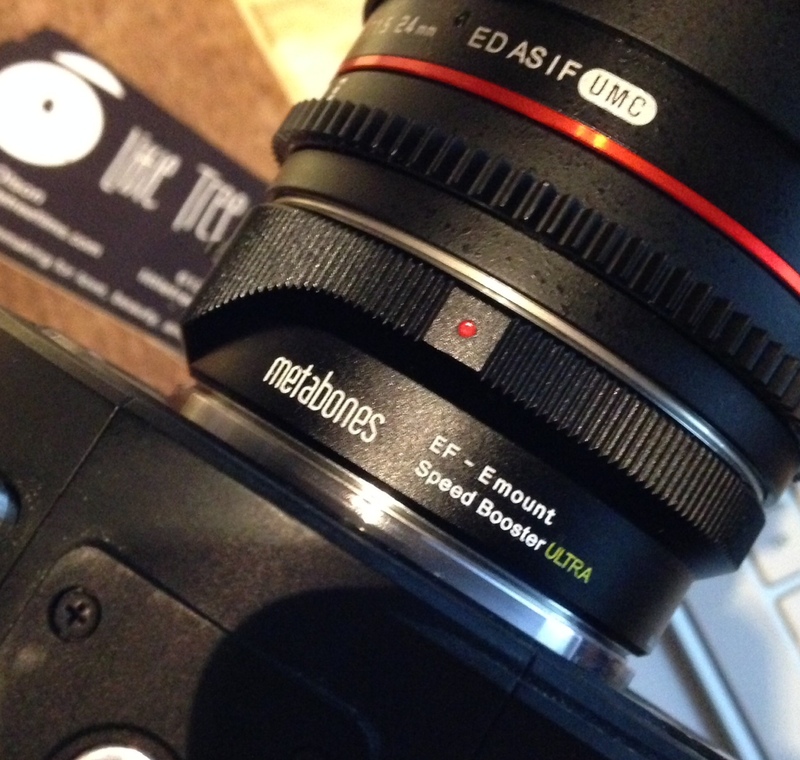 It is the Metabones Speed booster ULTRA Canon EF to Sony E mount lens adaptor. I’ll be testing it out on an FS700 this weekend. I was impressed with the speedbooster before and the Ultra promises to have increased corner sharpness and less vignetting. Sounds good to me. After waiting for a very long time the 50mm has arrived. Rokinon has a nice set of affordable primes. The 35mm is and 85 are great. The 24mm is acceptable on the 5D full sensor. But that 50 was really what was missing. This looks like a really good one. Looking forward to trying it out on a shoot tomorrow. It is not often you get to chat about Cinematography with other Cinematographers in a public forum. Today I had the opportunity to discuss with my fellow Cinematographers the state of things in the MSPIFF forum. There was a packed tent with folks that were industry veterans and film students. We talked about the number of options today with electronic motion picture cameras. Too many? We talked about tools of the trade and 3 out of the 4 really missed pulling out the meter and really only Greg Winter said he still does use a meter regularly. We talked some about lens quality and the overall shortage of quality lenses acknowledging that more lenses are being produced than ever before. Of course the discussion led to presentation and all of us agreed that digital projection is not there. Inconsistent, inaccurate, poor quality. All were hopeful that the quality would improve, perhaps. There was some discussion about the effect of not having a shutter on the electronic projection as a possible change to how we view films subconsciously. Along with tools, we talked about how some of the lighting tools have changed, but others have not been replaced (18K). We also had some discussion about other formats like 3D and interactive. Across the board 3D was viewed as a gimmick but Bo Hakala and Greg Winter had some interesting ideas on pushing the interactive nature of storytelling. One question from the audience was on practical vs digital effects. Kevin Horn and I said we would prefer to film practical effects in camera and Greg and Bo brought up the idea of shooting digital effects with enhancement from the practical. Really blending the two. Two hours went by really fast and I’m sure we could have kept chatting for at least another two.